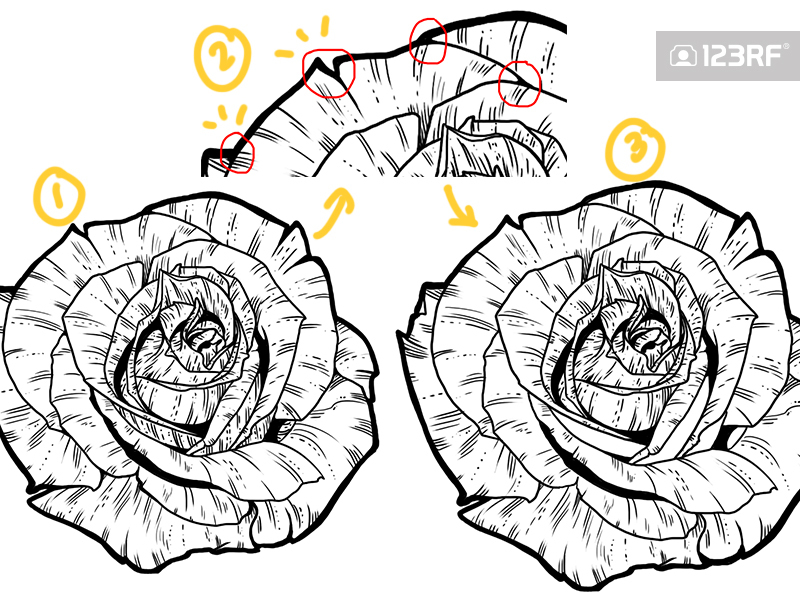 How do you draw a rose? 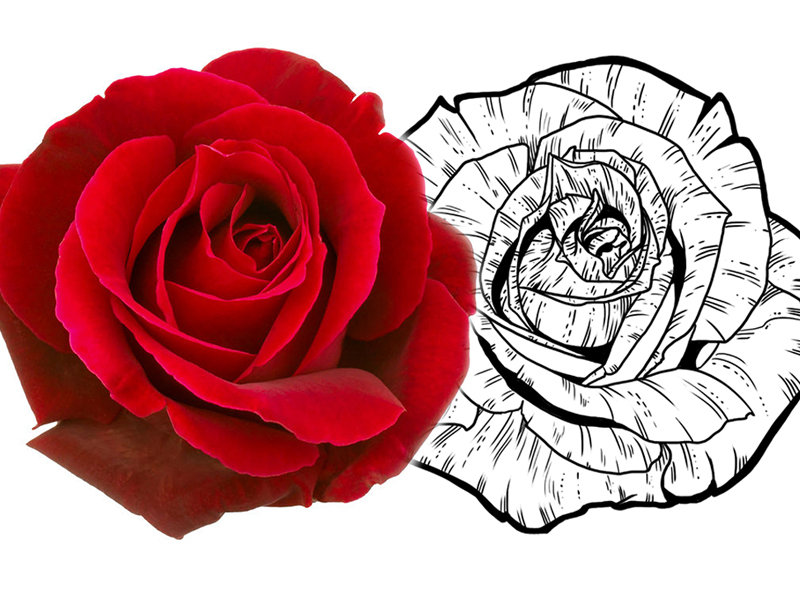 While other flowers may be simple enough to draw, roses are often considered daunting for beginners. 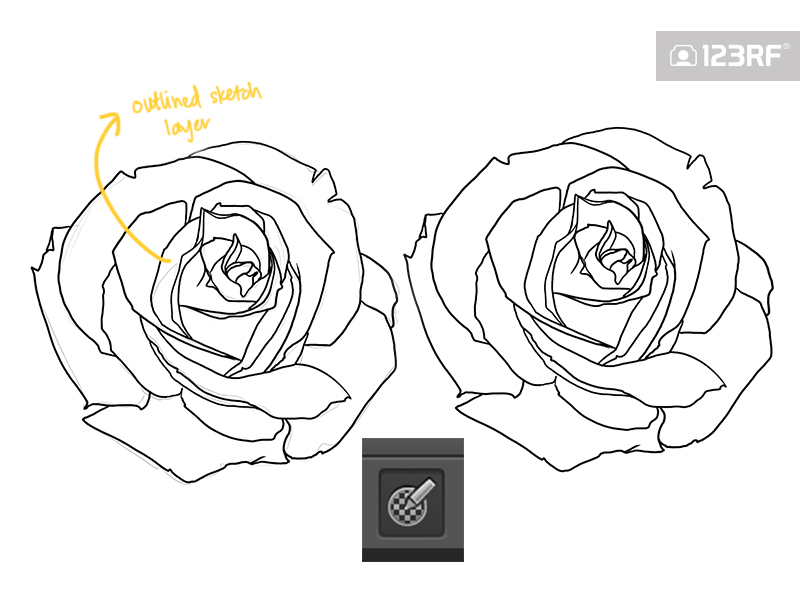 With this rose image reference from 123RF, we’ll explore how to draw line art of the flower of love. This method can be used to draw line art of nearly anything. You might have to modify the shading technique slightly for different textures, but the steps remain the same. To begin, select a brush of your choice. For line art, a solid round brush with a hard edge will work best (if you’d like a more pencil-like texture, use a diffused or ragged-edged brush). 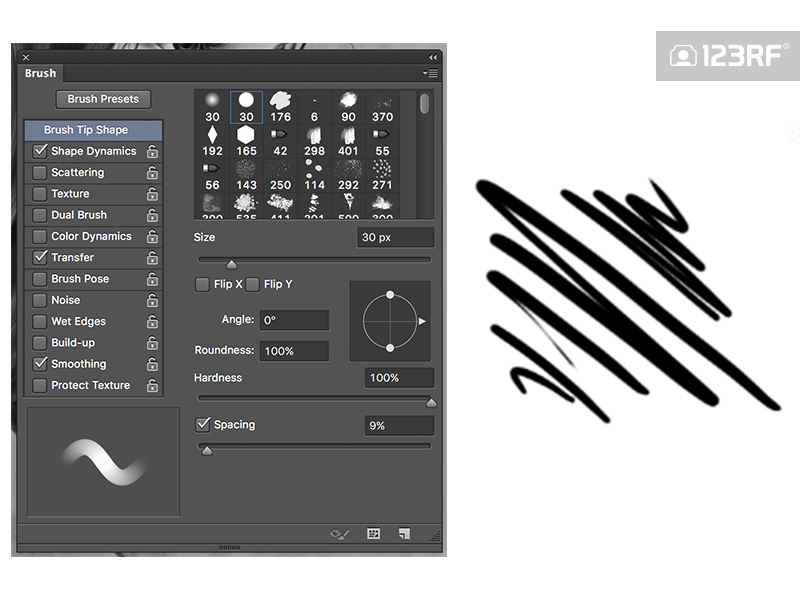 The brush used in today’s tutorial can be found in Photoshop CC’s original brush pack. 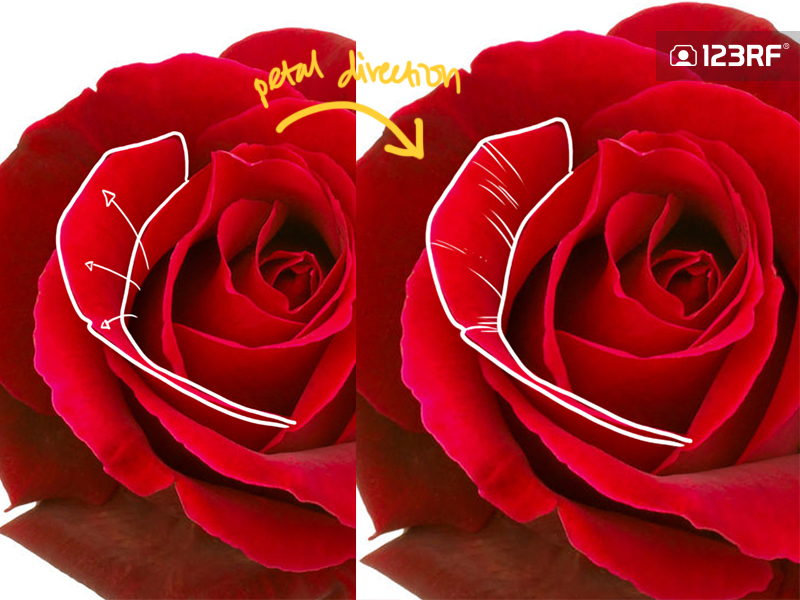 Taking your preferred reference photo or still life, roughly sketch out the shape of the flower. Unless you’re aiming for photorealistic detail, this does not have to be perfect, as flowers, in general, are imperfect in design. Once you have the sketch finished, lower the Opacity of the layer to allow you to easily draw on top it. In a new layer above the sketch, increase the size of your brush slightly and smoothly ink in the lines. Use even pressure or turn off brush sensitivity to get a clean consistent line. Once you have your clean consistent outline, you can turn off your sketch layer or delete it completely, you won’t need it again. If you want a simple line art, you could leave the drawing at that but to continue to build volume and shape, we will add more steps. To add weight to the lines, build up a thicker line on the outer edges of the petals. The thicker outline creates both perspectives and encloses the flower, allowing the eye to understand the layout. This is especially useful if drawing multiple flowers together in a bouquet or gathering. Next, we’ll draw the directional lines and details to help distinguish the different petals of the flower and create more depth within the flat drawing. To understand the direction of the petals it may help to physically identify the way small ridges in the petals lay. For example, in the above images, the ridges are quite clear and I have marked out the direction of the petal, indicating the way the petal falls and rests on other petals. Creating variation in the strokes and direction will help the line art to not look as staged or fake. Line art can look quite aged if the same patterns or textures are repeated over and over. Variation is a key element of all drawing methods. As you progress, you can start to add in blocks of black to act as the darkest shadows in the line art. This will lessen the ‘flat’ look. 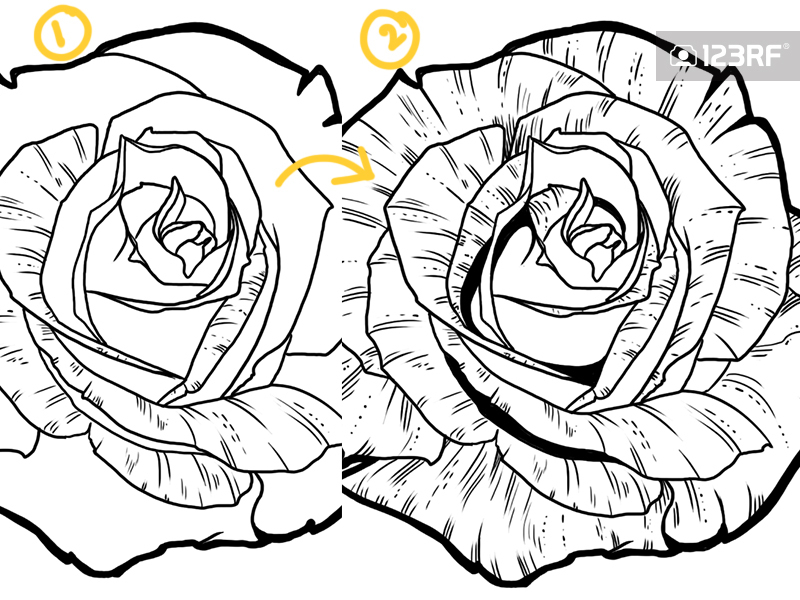 By the end, it might look a little like this, you can clearly perceive the volume and texture of the rose. To finish, round off the intersections between petals to soften the edges and give a more organic shape. You don’t often see sharp angles in flowers and leaves, so softening the lines will make it easier on the eyes as a whole. 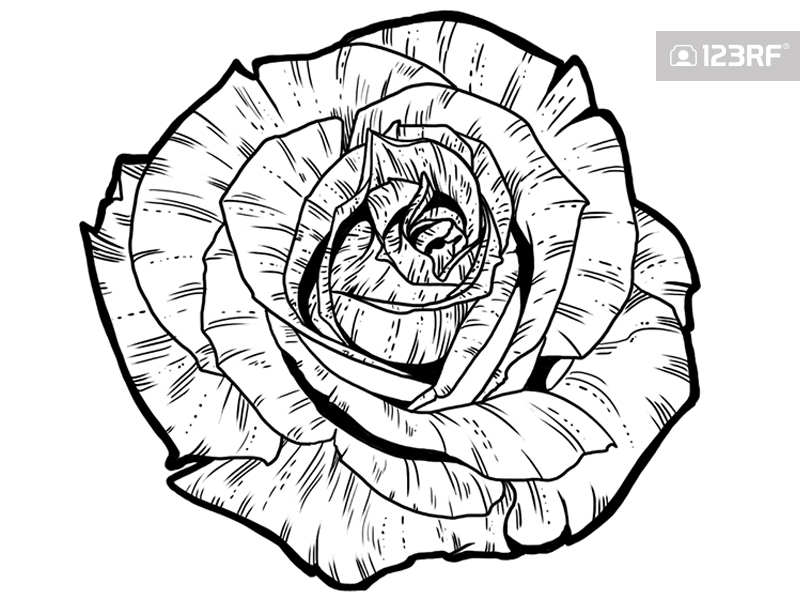 Now you have a finished clean line art of a rose. You can apply this technique to virtually anything if you really try. 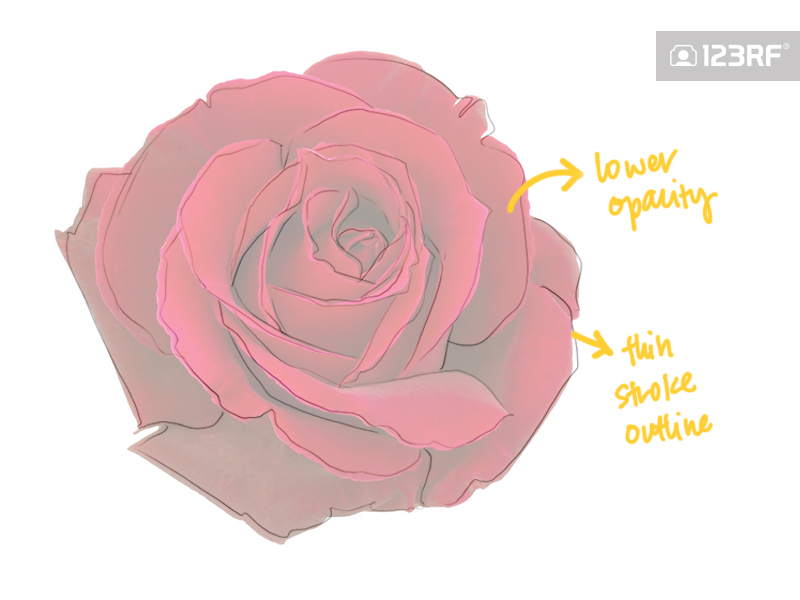 It may help to do some very loose sketches of the shapes within a rose to build up confidence. 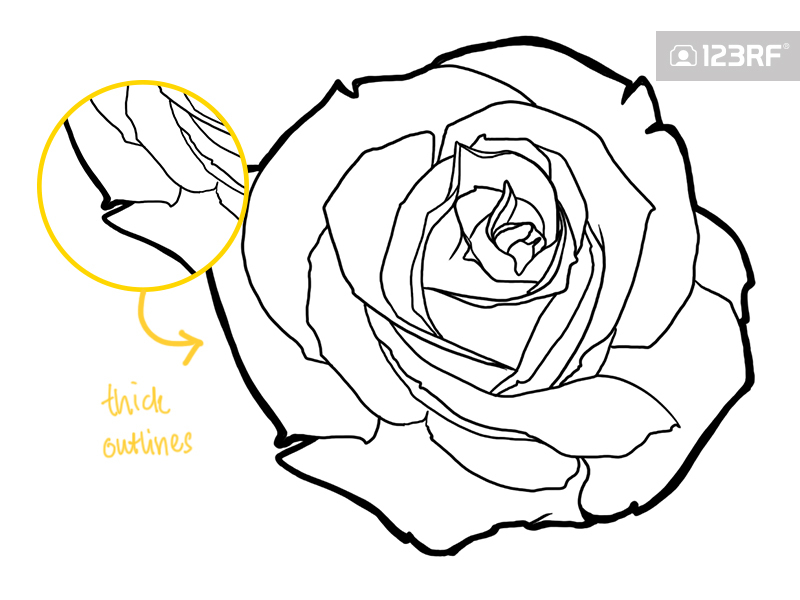 You’ve learned how to create a simple but effective line art drawing of a rose using a hard-edged brush. We also utilized the small details of the petals to effectively create volume and texture within the drawing, giving it shape and life. Pro Tip: If you want to practice drawing roses from life but would rather not buy one, you can use a cabbage. It’s practically identical in leaf formation but less pretty.